I shared months ago that I wanted to open up the free days on my blog (that I wasn’t blogging) to others who would love to fill those gaps and showcase their own work. Your talent out there is INCREDIBLE…..and I love sharing this little outlet with others who get a kick out creating, like I do. :) So, today is another day you get to see the craftiness of someone else. Pull up a chair (or a sofa) and enjoy with me……you won’t be disappointed. Hey there, Make It & Love It readers! I am Christina with Lincoln Street Blog and I have to be honest–>I am still pinching myself in disbelief that I have been chosen as a contributing blogger! 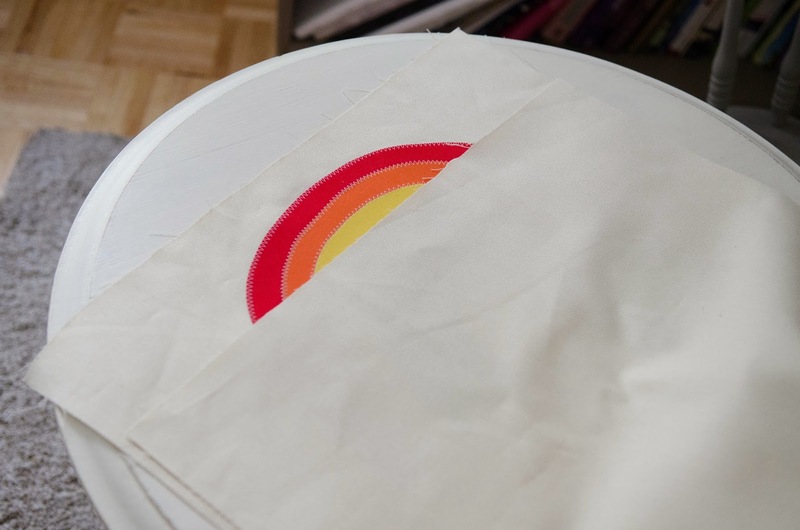 A simple and colorful rainbow with a little pot at one end, that also functions as a pocket. You can also use the little pocket to stash treats, like chocolate -or- surprises, like gold coins! Or- what the heck, combine them and make it chocolate gold coins–>for the win!!! The possibilities are endless. As you can see, my little guy was partial to the gold coins! Want to make one? Or two? Or a whole set? Alright, let’s get to “shamrock n’ rolling“! The first thing we need to talk about is supplies. I used khaki-colored denim for the actual placemat, but any type of medium to heavy weight material will work. Regular cotton solids are fine for this project. Make sure to get all the colors of the rainbow (fat quarters work great) plus black and white. You may want to write down what the colors of the rainbow are or you could risk leaving a color out. Then you will have to head aaaall the way back to the fabric store for the one color you forgot. Not that I am speaking from experience, that’s just what happened to a “friend” of mine. 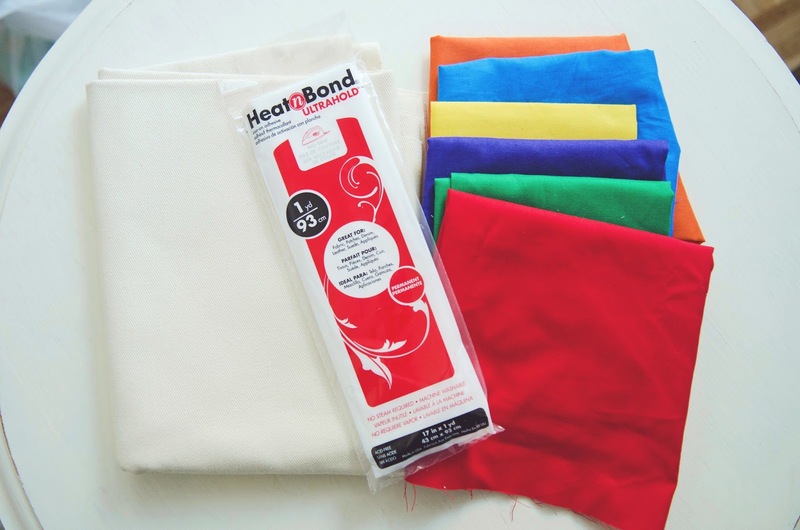 You also need to pick up a package of Heat n Bond and elastic thread. If your store only carries it by the yard then go ahead and purchase a full yard. Be sure to pre-wash all fabrics so that when your finished project gets dirty you can place it in the wash and not have to worry that it will shrink or lose it’s shape. Okay, now for the technical parts! Cut your main fabric (khaki denim) to 14×19 inches, this allows for a 1/2 inch seam allowance all the way around, making the finished placemat 13×18 inches. 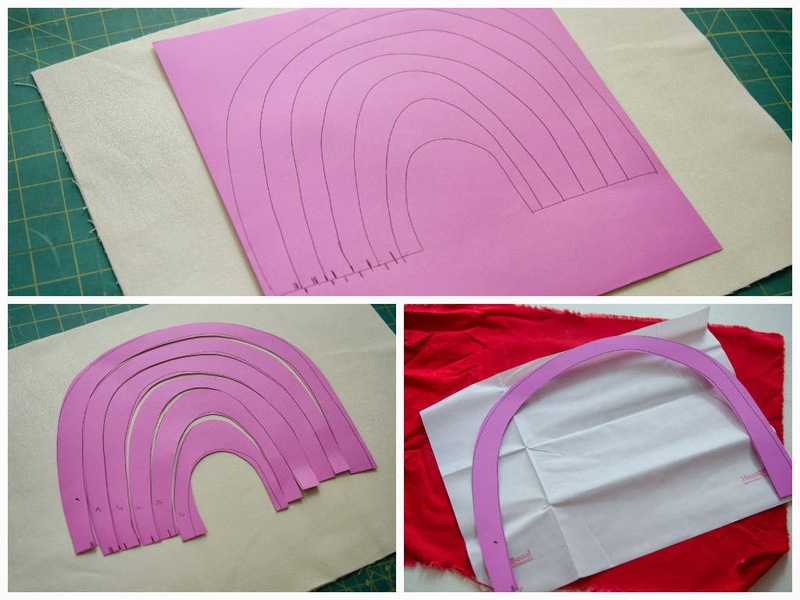 Next, grab a piece of paper (I used a 12×12 piece of cardstock) and draw out a rainbow. It doesn’t have to be perfect, as you can see from my pictures below. Number each arch from the outside in, 1-6, or vice versa. Cut your arches out individually. 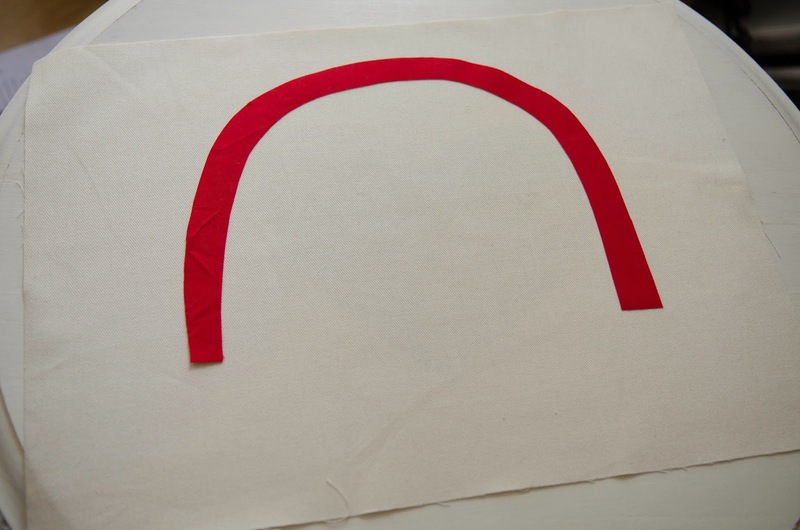 Now you need to take one arch at a time and cut a piece of Heat n Bond (more on fusible adhesives here) and a piece of fabric, that are both bigger than the arch you’re working with. Fuse the piece of the heat and bond to the “wrong” side of your fabric, per the instructions on the package. 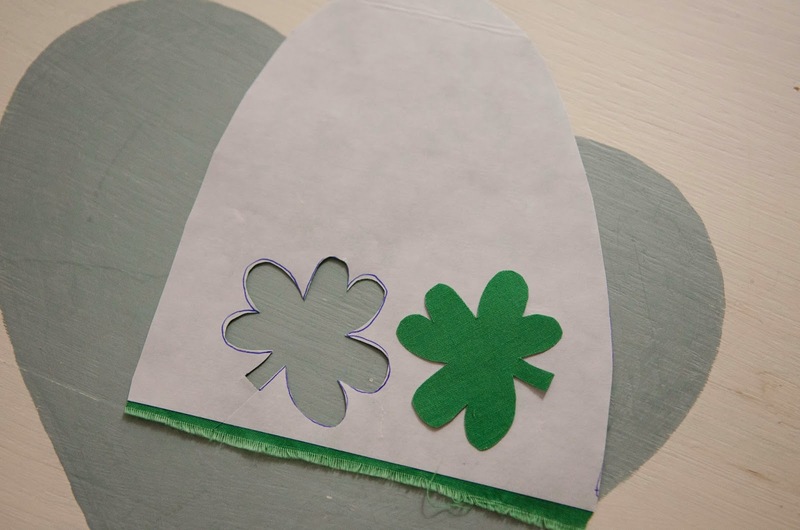 After tracing your arch, cut it out, peel the paper backing off, and place it on the front piece of your mat. (Side Note: you are only working with the top piece of your placemat, set the back piece aside for now until all arches, the cloud, and pot have been sewn to the front piece.) 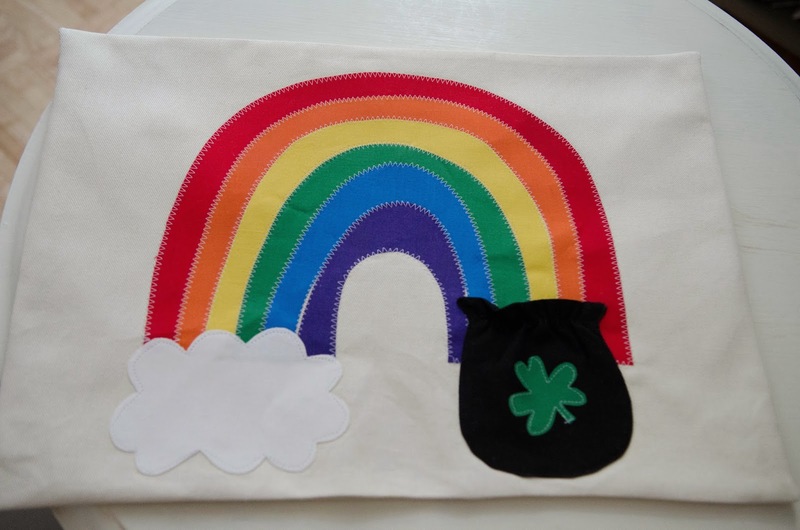 Make sure you place it towards the top and take into account you will need room for a cloud and pot of gold along the bottom. I would say one inch down from the top is a good place to put your first arch. Then, iron it to the placemat. Continue these steps for every single arch. 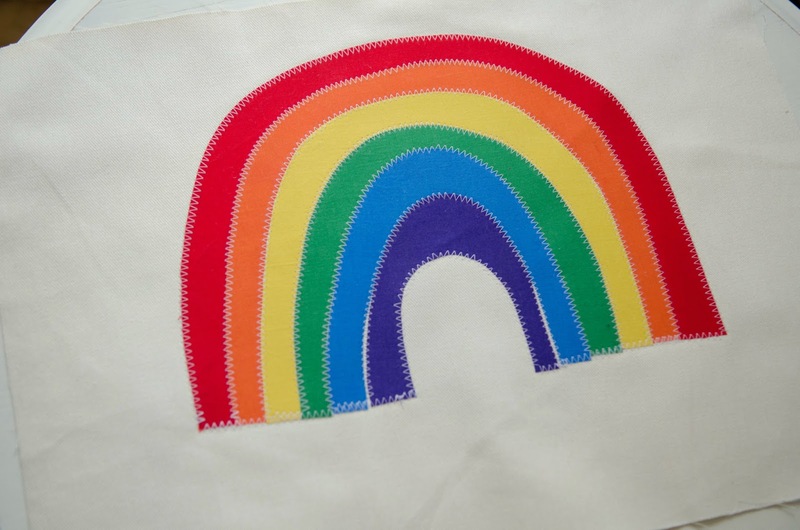 Once all your arches have been ironed on, go ahead and sew a zig-zag stitch all the way around the rainbow and between each arch, as pictured below. Next, you will create a cloud in the exact same fashion that you created the rainbow. Draw a cloud on a piece of scrap paper, cut it out, and then make sure you like the size of the cloud in proportion to the rainbow. 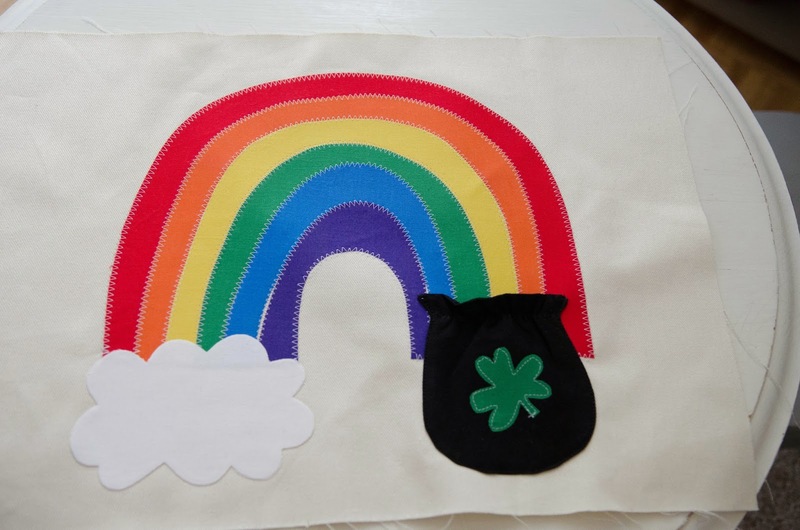 Once you are happy with your cloud, cut a piece of fabric and Heat n Bond large enough for your cloud template and then use the method above to adhere the cloud to your rainbow. 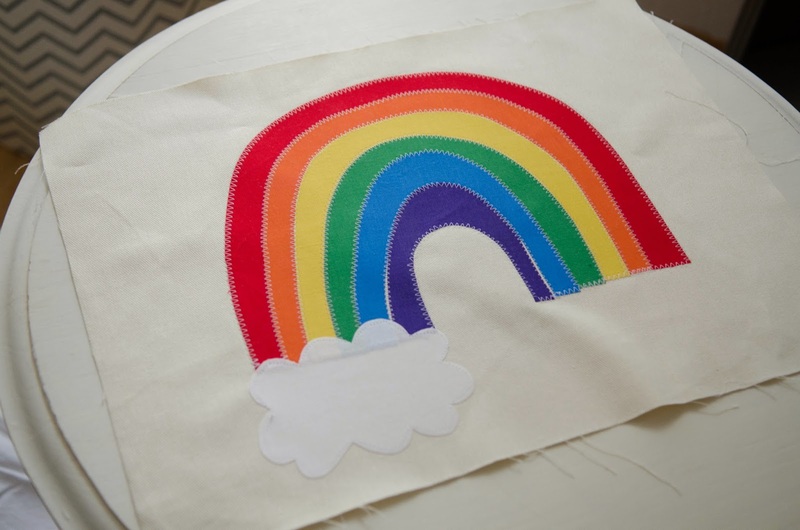 If your white cloud fabric is pretty thin, you may want to cut two layers of fabric so that you won’t see the color from the rainbow coming through the cloud. If you look at the picture below, you will see what it looks like when you only use one piece of white fabric. I ended up adding another piece right on top, so that you couldn’t see the rainbow come through as much. I used a straight stitch to secure the cloud down instead of a zig-zag stitch. Are you still with me? I hope so! 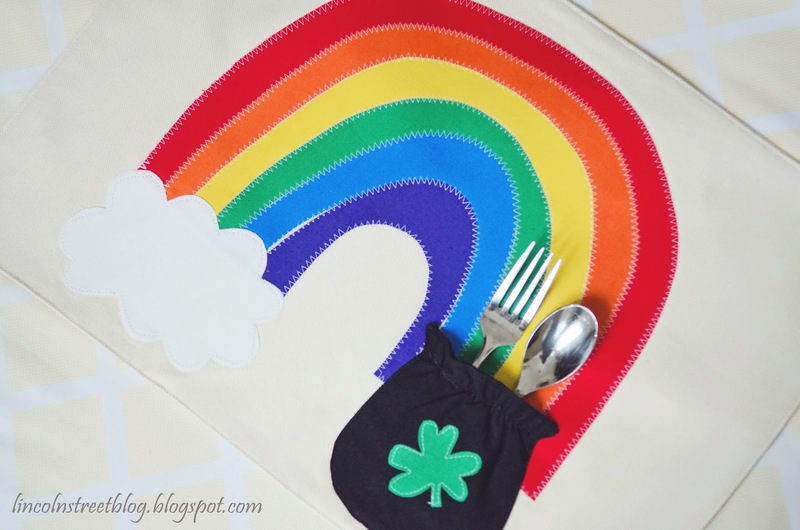 Let’s get to work on that pot of gold pocket! 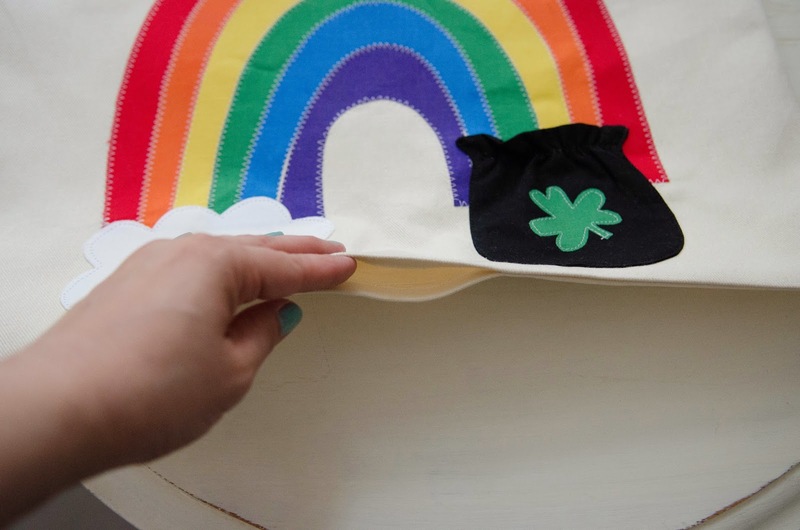 You probably already know what I am going to say next—>get out another piece of paper out and draw yourself up a pot for gold! While you’re at it, put that Heat n Bond away and loudly say, “good riddance,” when you do…it’ll make you feel better—>trust me. 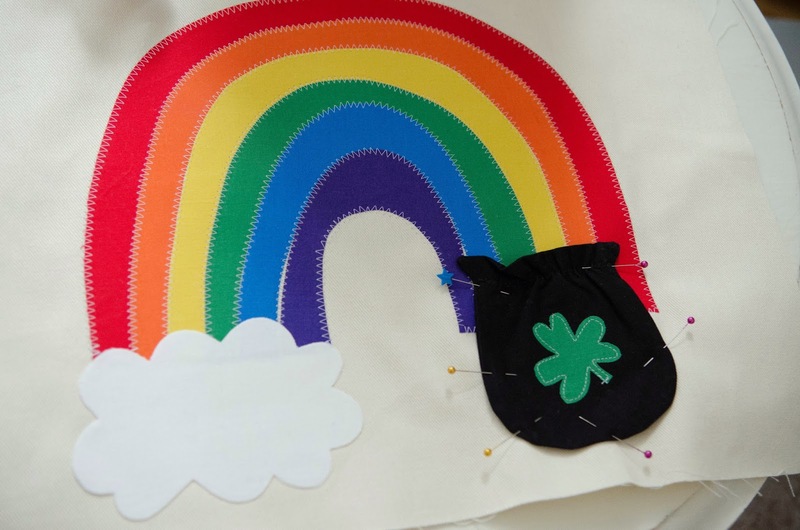 So, draw up a pot that will fit nicely tucked underneath the opposite side of the rainbow arch and be sure to add another 1/4 inch around all the edges, for a seam allowance. 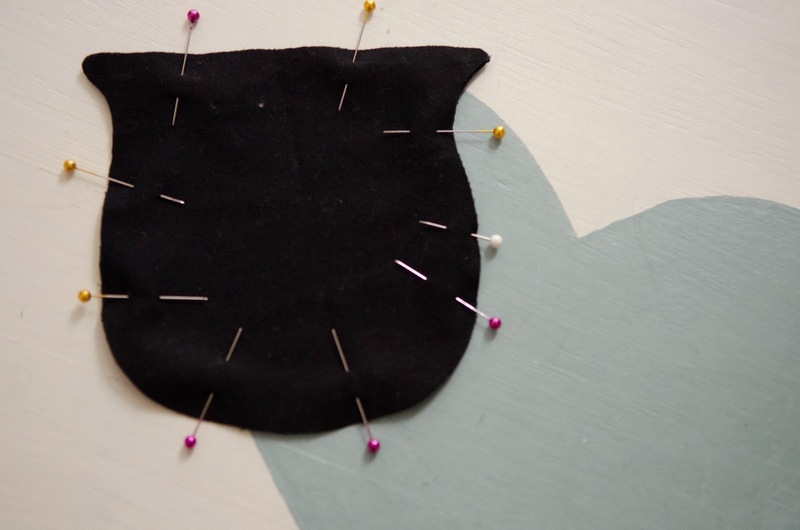 Pin your paper pattern to two pieces of black fabric and cut around your template. 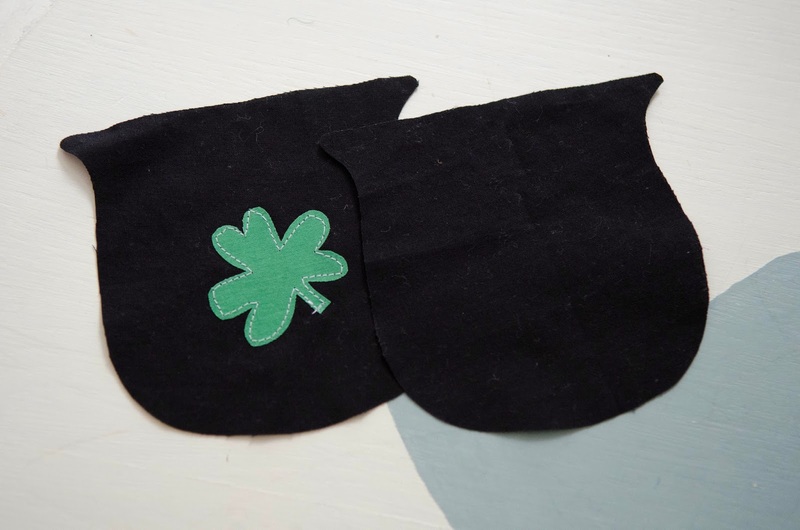 Then I ironed it down to one of the pot shapes and then stitched around the shamrock, just like the other parts of the rainbow. Place your 2 pot pieces together, right sides facing each other, and pin together. Turn your pot right side out using a small skewer or other pointy object to push all your points out. Tuck the opening at the bottom of the pot toward the inside a 1/4 inch, iron your pot flat, and admire your handiwork. 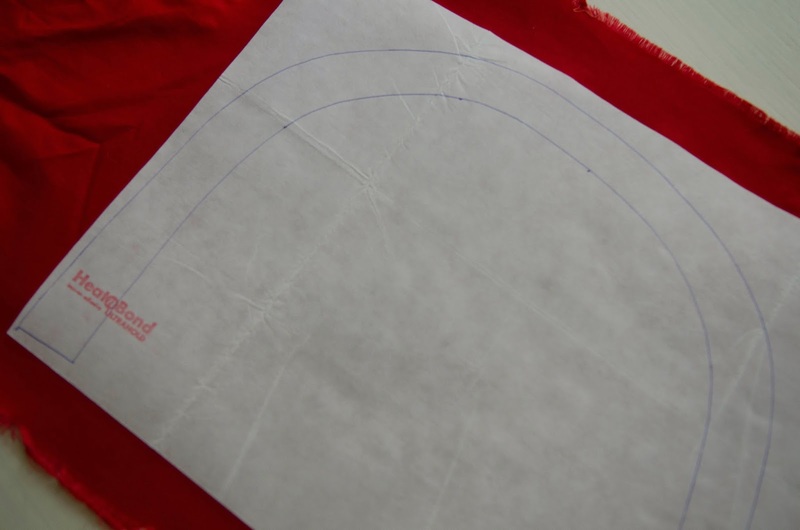 We will now use a shirring method for giving some stretch to the opening of the pot pocket. You will need to wind your bobbin with the elastic thread. I always do this by hand, do not wind it too tight or too loose. Once you insert your bobbin back into the case you should switch your tension between 5 and 7 and have your stitch setting the highest it will go, mine is a 4.8. The thread on top should be black to match the pocket. I recommend trying to shirr on a scrap piece of fabric first. You will just sew as usual, with the elastic thread on your bobbin and the settings as I have specified above. It should give a little gather to your fabric. 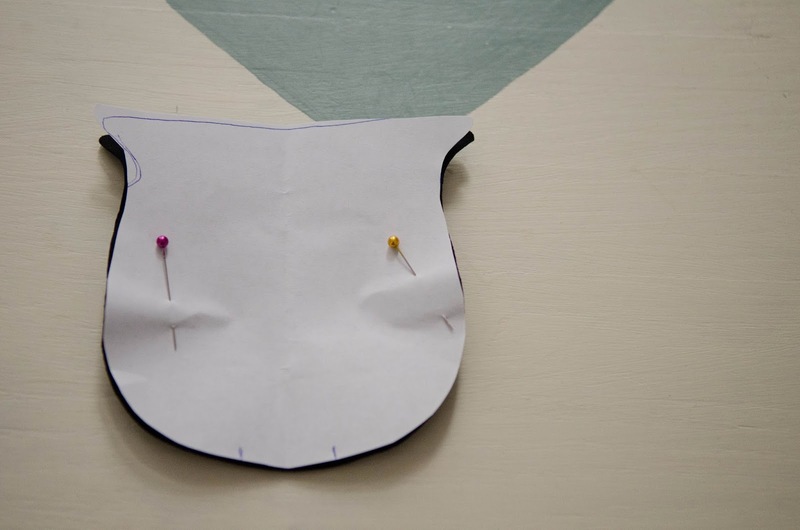 Once you feel comfortable go ahead and sew a straight line across your pocket, right in the middle of where the pot arches, about 1/2 inch down from the top of the pot. Add one more shirred line about 1/4 inch down from your first line of shirring. Once that is done, you can plug in your iron and set it on the steam setting. Steam the pocket where you shirred, at the top, to help shrink down the shirring and make it extra stretchy. (More info on shirring.) Now you need to pin your pocket to the placemat. Notice how I did not pin the top of the pot. I did that so that I would be sure not to sew the opening of the pot pocket closed. Make sure you have regular thread on your bobbin again. 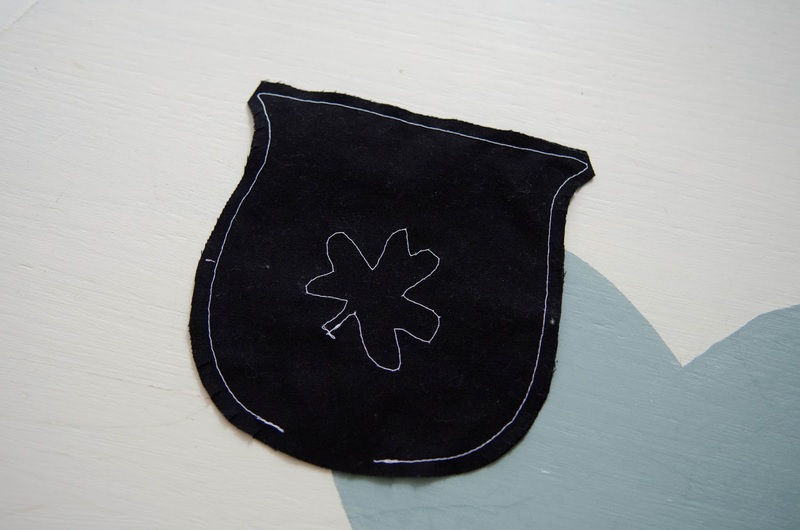 Sew all around your pocket, remembering to leave the opening un-sewn. Okay, we are officially almost through! Hang in there, you are doing great!! Take the back placemat piece that you set aside earlier and place it over the front piece of the placemat, right sides together. Sew around the entire placemat with a 1/2 inch seam allowance, leaving a 2 inch opening on the bottom. Clip your corners, turn it right side out, and push your corners out with a semi-sharp tool. Fold the opening at the bottom of the placemat towards the inside, a 1/2 inch and iron the entire placemat flat. 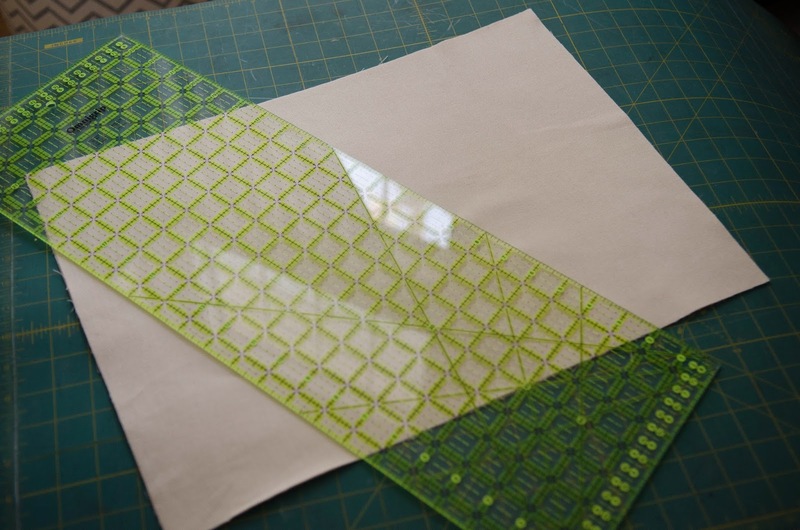 Here is the FINAL step–>top-stitch around the entire perimeter of the placemat, staying close to the edge. This will give your mat a professional look and will close up that opening at the bottom! Hooray–>you did it! Now for the fun part, putting it to use! Thank you so much for hanging in there and seeing this project through to the end. I just want to encourage each one of you that you CAN do this and any other project you set your mind to–> you can even make it your own! Thanks so much Anne! Christina did a stellar job on it! Thank you so much Ashley, I appreciate YOU! OMG. I can’t handle this. 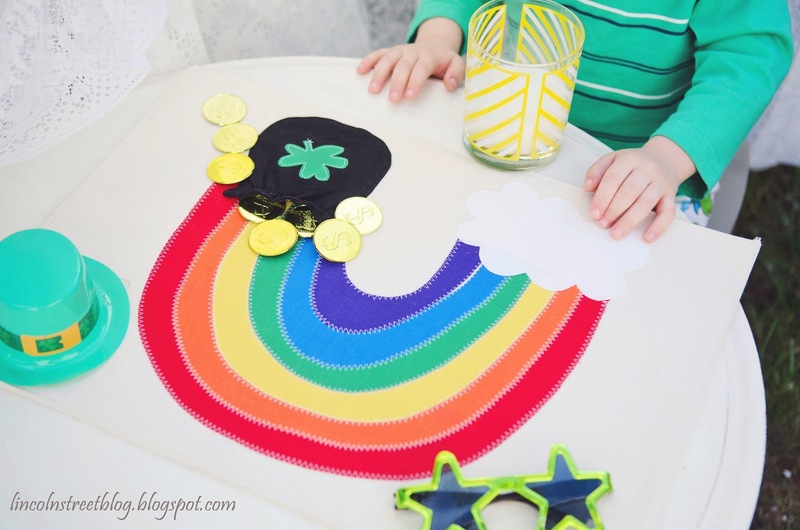 I just moved and don’t have time for this cute project before St. Patty’s day, but maybe I’ll be able to get it done for next year ;) It’s so cute! Thanks for sharing! SO cute! 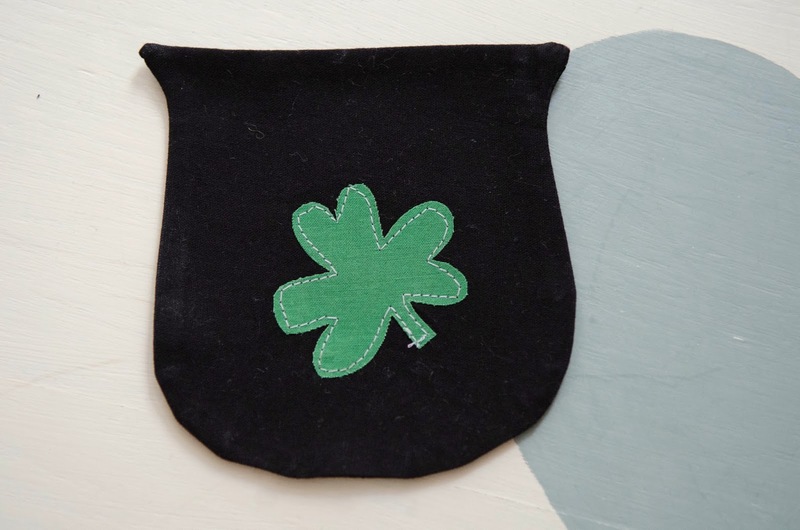 I couldn’t think of anything to make for St. Patrick’s day and now I have something! Thanks a ton!